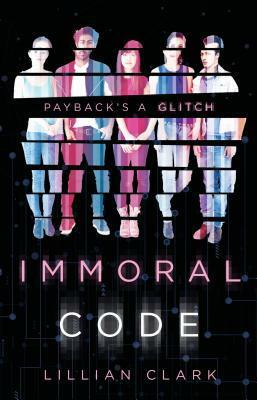 Immoral Code is the story of 5 teenagers, a group of friends that come together when one of them needs it the most. Bellamy is a certified genius and is on the road to MIT after graduating from high school. The only thing is, her biological father is the reason she may never get the chance to go. It has always been Bellamy and her mother, struggling to make ends meet. Her father left long ago, before Bellamy was even born but he must fill out financial aid paperwork before she can be approved. Turns out he has an insane amount of money from the company he created, so Bellamy is not qualified for financial aid. But of course she and her mother cannot afford MIT, so her dreams are completely dashed. Except, her best friend Nari is a hacker and devises a plan that involves all 5 of the friends performing a heist (of sorts) to siphon money from Bellamy’s father’s company because he owes her that much, right? The group of friends and their individual personalities is what makes this book. I adore each and every one of them. They are completely fleshed out and as the perspective rotates between chapters you always know exactly who is speaking. Honestly, I wish I had been part of this friend group in high school! While the story isn’t exactly fast-paced, the really characters drive this story. Lillian Clark does such an excellent job of navigating the difficulties of being a teenager on the cusp of becoming an adult. The relationships and conversations that are not always easy and how we are all just humans making mistakes. Thank you so much to Alfred A. Knopf Books for Young Readers and NetGalley for the opportunity to review this book! Synopsis: For Nari, aka Narioka Diane, aka hacker digital alter ego “d0l0s,” it’s college and then a career at “one of the big ones,” like Google or Apple. Keagan, her sweet, sensitive boyfriend, is happy to follow her wherever she may lead. Reese is an ace/aro visual artist with plans to travel the world. Santiago is off to Stanford on a diving scholarship, with very real Olympic hopes. And Bellamy? Physics genius Bellamy is admitted to MIT—but the student loan she’d been counting on is denied when it turns out her estranged father—one Robert Foster—is loaded.